Supreme Court voting rights decisions: Contradictions in Wisconsin, Ohio, North Carolina, Texas. The Supreme Court just made it harder to vote in some states and easier in others. 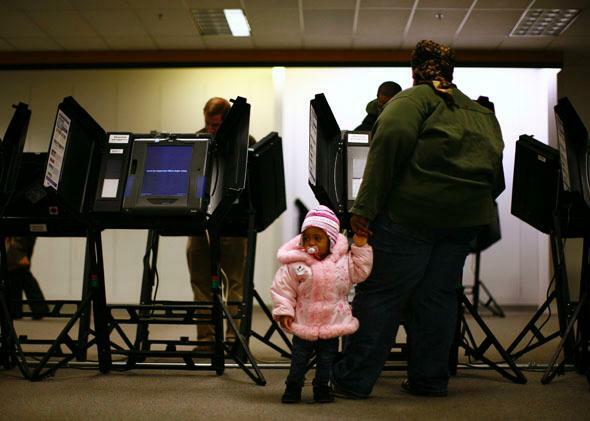 People take part in early voting in Columbus, Ohio, in 2012. If you have been following developments at the Supreme Court in voting cases over the past few weeks, the results have been dizzying and apparently inconsistent. First the court blocked a lower court ruling that had restored a week of early voting in Ohio. Then the court blocked a lower court ruling that had restored North Carolina’s recently repealed provisions allowing for same-day voter registration and the counting of early voting. Then, Thursday night, the court blocked a lower court ruling that had put Wisconsin’s voter ID law into immediate effect, after lower courts had consistently blocked its use until voting rights challenges had run their course. And soon enough, the court may be asked to block a 147-page lower court ruling, issued late Thursday night, that held Texas’ voter ID law unconstitutional and a violation of the Voting Rights Act. Sometimes (as in Wisconsin) the Supreme Court has been protecting voters; at other times (as in Ohio and North Carolina) it appears to be protecting the ability of states to impose whatever voting rules they want. But there is a consistent theme in the court’s actions, which we can call the “Purcell principle” after the 2006 Supreme Court case Purcell v. Gonzalez: Lower courts should be very reluctant to change the rules just before an election, because of the risk of voter confusion and chaos for election officials. The Texas case may raise the hardest issue under the Purcell principle, and how it gets resolved will matter a lot for these types of election challenges going forward. As I explained in a recent Slate column, ultimately at issue in the Ohio, North Carolina, Wisconsin, and Texas cases is how broadly courts are going to intervene to protect voting rights in states where Republican legislatures have made it harder to register and to vote. All the cases raise claims under the U.S. Constitution’s equal protection clause and Section 2 of the Voting Rights Act. Ultimately, the Supreme Court could well side with the conservative judges in the courts below who have read these protections narrowly and not worried too much about the risk of voter disenfranchisement, rather than siding with the more liberal judges who have blocked restrictive laws for hurting minority voters, poor voters, and others. But none of these cases so far reached (or will reach) the Supreme Court as fully formed final cases. Instead, they have come up on emergency requests to block lower court orders that were put into effect just weeks before the election. The rulings have had election officials scrambling in Ohio, North Carolina, and Wisconsin to comply with new, and sometimes conflicting, court orders. While I am not sure how the Purcell principle should be applied to the case of Texas, I have a good sense how it will be resolved, either by an appeals court or the Supreme Court: I expect it will be resolved to let Texas use its ID law during the upcoming election. My prediction is based on the same thing I used to predict that the trial judge would strike down Texas’ law: the ideology of the judge and the political party of the president nominating the judge. It is sad in 2014 that this is a great predictor of how courts have decided these cases. But at least in the cases of North Carolina and Wisconsin, politics did not always predict Supreme Court justices’ decisions. Two Democrat-appointed justices (Stephen Breyer and Elena Kagan) voted to stop the last-minute expansion of voting rights in North Carolina, and two Republican appointees (Chief Justice John Roberts and Justice Anthony Kennedy) voted to stop the last-minute implementation of voter ID in Wisconsin. Maybe there’s a glimmer of hope in that.